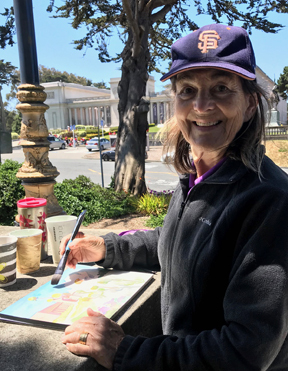 There is no shortage of tempting subjects in San Fancisco for plein air painters, and Karen hardly needs prodding to go paint in the City. Here she is on a perfect day at San Francisco’s Legion of Honor Art Museum. It’s not complicated. I paint because it’s fun. Well, that’s a bit too facile. There’s more to it, of course…but fun, joy, delight, and exhilaration all are part and parcel of what happens when I paint subjects I love. And I paint only those things. Okay, then, what “things” are those? I’m going to go out on a limb and make a blanket assertion: ALL my work relates in some way to nature. I grew up an outdoorsy tomboy. I was a Girl Scout, and I loved being a Girl Scout because most of our really cool activities were outdoors. Hiking. Swimming. Diving. Camping. Fishing. Archery. Learning the ways of the Indians of Texas (where I lived during my grade school years). I was ten when I learned to split wood with an axe; eleven when I killed a copperhead snake because I thought it was about to strike my friend. I learned to strip tree bark to make rope and twine. I learned to make woods furniture by lashing sticks and branches together with that twine. And of course, I learned to build a proper fire and start it with a stick and string (I’m not so sure I could do that now!). But I did have an outlet for my passion. I was probably about six or seven when I discovered I could draw a believable horse. I abandoned garbage trucks and started turning out a years-long stream of horse creations. I made books full of horse imagery. I wrote illustrated novellas and books of poems about horses. I memorized entire dialogues of movies that featured horses as characters. My mother, a talented artist, taught me a little about painting, and I made elaborate equestrian pictures on cardboard boxes in tempera and a little oil. When people asked me what I wanted to be when I grew up, my answer was quick and confident: a Cowgirl Artist. My family left Texas when I was in sixth grade and thereafter we moved several times around the upper Midwest and east, and I never put down roots again until I was an adult. The frequent moves meant that I formed few bonds of friendship, and I did not participate much in activities that might have nurtured my natural inclinations. Winters were brutal by comparison with what I knew, and I never got used to being cold. (Ironically, I became, and still am, an avid skier, but that was much later!). I wasn’t particularly happy during those years, but it was middle school. Who is actually happy in middle school?? Again I took refuge in art. Not painting. I didn’t paint during this time. But I drew. All the time. Fashion models, cars, jewelry, portraits of my friends and classmates, and yes, still, horses. When I got to high school, though, I pretty much gave up on art. Time to get serious, my parents said. Don’t waste your time with art, my mother said. You can’t make a living as an artist. She was loaded with talent and took a degree in fine art from University of Buffalo. But she thought even then that nobody could make a living from making and selling artwork, and I don’t think she even tried. Instead she taught art in a public school and hated it. Her marriage to my dad saved her from having to think any further about a career, and her art output was pretty much limited thereafter to arranging flowers and making posters for the PTA. You are good at math and science, Dad said. You should be a nurse. It’s true—I did like, and was good at, math and science. But what did that have to do with nursing? Well, in those days, women pretty much had three career choices: nurse, teacher, secretary—something to do until you could get a man, get married, and become a housewife. I guess Dad thought nursing was a reasonable choice for a nerdy math girl, but I did not want to be a nurse. And I didn’t want to be a teacher or a secretary either. Or a housewife. Actually I didn’t know what I wanted to be. I knew when I was six. I had no idea when I was sixteen. And being a good little girl, I did what my dad said and enrolled in University of Michigan’s nursing school. I’ll summarize the next few years by saying that though it was an ongoing disaster, it led me, by a weird, labyrinthine path, back to art. This happened when I had been married for a couple of years, had a young baby, and was living in the San Francisco Bay Area. (Yes, like my mother, I, too, fled into marriage because I didn’t know what else to do). Right after our wedding my husband and I had spent some time in San Francisco with the U. S. Navy. We loved it, and we came back to live here as soon as he was discharged. It was a good decision. At last I felt like I had a home, and I started setting down some of those missing roots (now very deep). When our daughter was little, we lived in Marin County, north of the City. It was close enough to the City to stay connected, but it was also rural and sunny. My travels at that time were on the seat of my bicycle. I explored every corner of Marin with my daughter in a child’s seat on the back of my bike. One day I was exploring the town of Novato, and I noticed an art supplies shop. I parked my bike and went in with my baby. A young woman, Barbara Johnston, stood behind the counter; behind her was a baby about the age of mine in a playpen. The walls of the shop were covered with dazzling watercolor paintings. Young mothers seem ready to bond at the drop of a hat, and in just a few moments Barbara and I were chatting. I asked about the watercolors and she said she taught classes in her shop, and the work was done by her and her students. My earlier art experience did not include watercolor. I had tried that in grade school, and I wound up in thinking like many others, that watercolor is “too hard”. But this looked promising, and I got excited. Sign me up! I said. PLEASE! Right now! Well, I had to wait a few weeks for Barbara’s next series of classes, but after that and for the next couple of years, I went there weekly, child in tow. This time I took to watercolor with a passion that had a strange, vaguely familiar, feeling. One day, Barbara arranged for a plein air field trip, and it happened to be a nearby farm with horses. The vague feeling became suddenly clear as day! That feeling I had when I was little and had loved and painted horses was still in me! A few years later my life took another crazy lurch. My marriage deteriorated and eventually ended, and I was alone with my child and needing to earn a living. It wasn’t a good period, but again I sought refuge in art, though in an unexpected way. I went up to the local community college thinking I would enroll in a painting class, but noticed something called “commercial art”. I signed up, even though I had only a vague idea what that was, and I didn’t even expect to like it. I was just curious. But it launched me into what would become a long and rewarding career in graphic design and illustration. In time I had a thriving business (it is still operating), and I hugely enjoyed this work. The downside: for most of the years I have worked in this field, I had little time to paint as a fine artist. I missed fine art, and in recent years, yet another nutty circumstance brought me back to fine art painting. Among my various interests and hobbies is African music and dance. I have played and danced with a number of groups here in the Bay Area, and one of these does an intensive dance workshop on Maui every year. I could never go to these workshops because they always took place in February, which was high season for my design business, as we did a lot of year-end corporate annual reports that by law had to be published during the first quarter of the following year. However, with the Enron scandal in the early 2000s, that whole business changed, and annual reports were no longer much fun, so I stopped doing them. And then suddenly I was free in February! So I went to Maui and danced! This style of dance is extremely energetic and strenuous, and after about five days of two-a-day, two-hour dance classes, I was ready for a rest and a little bit of sightseeing. So I got into my rental car and said to it, “take me somewhere.” So it took me on a road in what’s called “upcountry” by Maui locals (as opposed to the beaches) and into a little cow town called Makawao. There I happened upon a fine little art gallery called Viewpoints, and at the time I stopped in, there were no other visitors, and the fellow on duty was friendly. We had a nice chat, and in the course of it, he asked to see the sketchbook I had in my hand. I showed it to him, and he then told me about a plein air festival coming up in a couple of months. He said I should come. No, I thought, I can’t do that. I haven’t painted in YEARS. And besides, I can’t come back here again so SOON! Well, back at home, the thought wouldn’t leave me alone. Like a stubborn bee, it buzzed around my head incessantly. Long story short: I found out that, just like swimming or riding a bicycle, you don’t forget how to paint! So I went back to Maui for the festival, and after that there was no turning back! I’ve now cut back my design work enough that I can devote most of my time to fine art. And that sampling of plein air on Maui suited me so well that it’s now what I most enjoy as a painter. Living as I do among stunning scenery in California, there is plenty of subject matter right outside my door. That’s fine, but I’m also still an avid traveler, cyclist, skier, and hiker, and my suitcase is always near at hand, waiting for another trip. And my backpack always contains my small plein air kit, just in case!